Are you looking to buy a new pillow? Have you considered purchasing the Coop Home Goods memory foam pillow? The Coop Home Goods company prides themselves on their specialty pillow made of the highest-quality shredded memory foam designed to suit a wide variety of sleepers, and provide them with extraordinary sleeping experience. The cover of this pillow is enriched with bamboo which prevents the build-up of heat and helps create a breathable and cool-sleeping surface. It provides a comfortable contouring for your head and neck and is available at more than a reasonable price. The Coop Home Goods pillow comes vacuum packed in plastic and tightly folded, and although it may seem incredibly flat upon opening the package, it will quickly begin to inflate and gain its loft and softness. You can fluff it simply by shaking it out and pushing the sides, and it will quickly decompress into a plush, full-sized pillow. As the pillow comes wrapped in a plastic package and as it is a memory foam pillow there may be a slight off-gassing smell, but it will dissipate within a few days. The pillow is available in standard (20x26), queen (20x30), and king size (20x36), and you can order whichever size you want, depending on your needs and preferences. 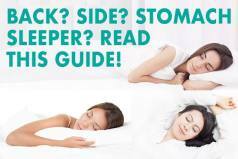 The most popular sizes are standard and queen sizes, although you can order a king-sized pillow as well if you are a larger and taller sleeper and you need the pillow large and supportive enough to accommodate the width or your shoulders. 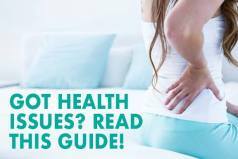 The pillows of this size, however, may not be an ideal pick for smaller people as they may be too lofty for them and will force their heads towards the edges and cause spinal misalignment. The one we tested is a standard sized pillow. It is adjustable and it allowed us to achieve any level of comfort we needed for different sleeping positions during the night. The Coop Home Goods pillow is stuffed with shredded Visco elastic memory foam. Such construction of this pillow allows better airflow and aids in cooling. It also allows you to adjust the filling to achieve the loft that will perfectly work for you simply by unzipping the cover and the inner case and removing some of the filling or adding it back. Something we have found is really important when choosing a pillow, as it enables you to customize things to your individual preference. The cover of this pillow is quilted and soft, made of 40% of bamboo and 60% of polyester. It is completely removable and can be used as a stand-alone pillowcase as it is machine washable and dryable. It can be removed with a zipper that is double stitched for durability. Not only is the cover easy to remove and be cleaned, but it is also very plush and aesthetically pleasing with its triangle design. The bamboo in the cover is a natural hypoallergenic fiber known for its high porosity and for being an effective dust mite repellent. This makes the coop home goods pillow very breathable, it wicks away moisture, and prevents build-up of heat which helps sleepers stay cool throughout the night. It provides a very soft and pleasant feel while its quilting helps the pillow keep its overall shape. There is also the inner case within this cover which surrounds the actual filling. The case is tightly-knit and smooth, made of Interlock fabric. It is plain white, and it is much thinner than the bamboo enriched outer cover. It also has a zipper and a double stitched seam and allows you to easily remove or add shredded memory foam to achieve the desired comfort. Shredded memory foam within this pillow provides support and contour without causing your head to sink all the way down through the pillow. This filling seems to be the best for most sleepers as it is adjustable and you can take some of it out or add it for comfort. The Coop pillow perfectly supports your head and neck without compressing too much, and it is breathable due to its unique cover and air pockets left between the individual pieces of memory foam. One good thing about this pillow is that you will not feel these pieces of memory foam through the cover and pillowcase as they act as one piece while offering more give and adjustability than one flat piece of foam. This makes the pillow supportive and yet soft enough to provide comfortable and quality sleep. It perfectly contours to your neck and head and allows you to easily change sleeping positions throughout the night. We found that the Coop Home Goods pillow is suitable for all sleeping positions, which is again due to the use of shredded memory foam in its construction and its adjustability. When fully fluffed the pillow is ideal for side sleeping while taking some of the filling out can easily change the support to suit either stomach or back sleepers. It is on the firmer side when the full amount of foam is within, but it softens as you take the foam out, and it may take a few attempts before you get it just right. In each position Andrew and I found our heads and necks to be well supported. The pillow has the classic memory foam contour hug feeling, but it does not cause you to feel trapped in foam. As it has been already mentioned, this pillow sleeps quite cool due to its special cooling properties coming from shredded memory foam and unique breathable cover using natural bamboo fibers and other materials that do not retain heat and that allow free circulation of air through the pillow. If you feel the Coop Home Goods pillow going flat, you can throw it in a dryer on a low tumble and it will regain its original shape. The company actually recommends you to do this once a month to maintain the maximum performance of this pillow. The Coop Home Goods Pillows are pretty affordable with a standard-sized pillow coming in at $55, queen at $51, and king at $56. These prices are more than reasonable given the quality materials used in the construction of this pillow and the extraordinary comfort it provides. Besides this, the company offers a 5-year warranty and a 30 day sleep trial which makes this pillow a risk-free investment and means that you can return the pillow if you don’t find it to be to your liking and you will get your money back. Click here to get the best price on the Coop Home Goods pillow. Is the Coop Home Goods Pillow right for you? Adjustable pillows – The Coop Home Goods pillow is adjustable in that its zippered cover and inner case provide total access to shredded memory foam filling within it, so you can take some of it out or add it back in to achieve the loft and comfort needed for your preferred sleeping position. 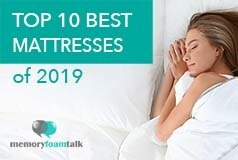 Memory foam feel – This pillow is stuffed with shredded memory foam and it has all the benefits of classic memory foam without causing you to feel trapped in it. Cool-sleeping pillows – The shredded memory foam within this pillow makes it breathable, while its unique cover using natural bamboo fibers aids in this and prevents the retention of heat thus creating a cool and comfortable sleeping surface. Hypoallergenic pillows – The bamboo in the cover of this pillow is naturally hypoallergenic which makes the pillow resistant to allergens and dust mites while memory foam pieces contribute to this. In addition, these memory foam pieces are CertiPUR-US certified which means that they are made without using ozone depleters, lead, mercury, heavy metals, and other dangerous chemicals. 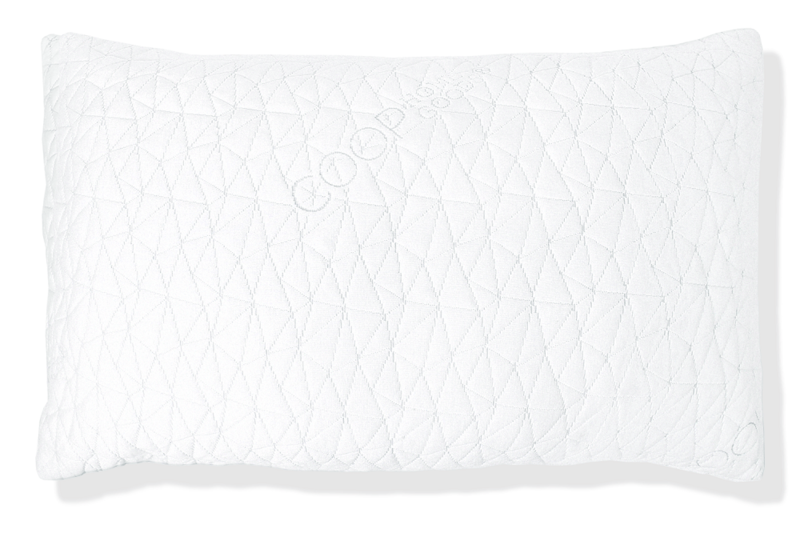 The Coop Home Goods pillow is one of our favorite pillows as it is made of shredded memory foam which allows a great deal of customization, so it can basically suit all our sleep positions. It provides extraordinary comfort and support, and it is unlike any other pillow currently present on the market due to this customizable design and cool exterior bamboo cover. If you are looking for an adjustable, cool-sleeping memory foam pillow, the Coop Home Goods pillow may be the right choice for you. It allows you to adjust its loft to any sleep style and provides you with proper cervical alignment, prevents the build-up of heat, and creates a cool sleeping surface that will keep you asleep all night long. Hopefully our review of the Coop Home Goods memory foam pillow helps you out in your quest for the perfect pillow!